As the US gets ready for the Thanksgiving holiday, it’s sobering to think of the wildfires that are burning in the country’s southeast. 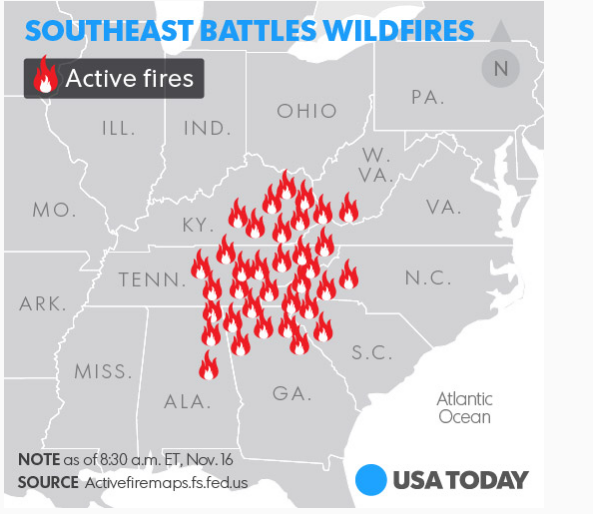 After months of weather that has been way warmer and dryer than usual, there are several fires burning throughout Kentucky, the Carolinas, Georgia and (worst of all) Tennessee. The news stories have been focused on the vulnerability of some iconic parts of the country, including Great Smoky Mountains National Park, and The Trail of Tears. Several cities are coping with smoky air at problematic levels, including Atlanta, Knoxville, Chattanooga and more. For insurers, the news is slightly different – wildfire season should be over by now, and wildfires in this part of the country are unusual. However, any insurer thinking like that would be wrong. Wildfire season doesn’t have a start and an end – wildfire season is any time of year after a few dry months of weather. And there is no part of the country immune to wildfire – these states have a long and well-documented history of wildfire. Any property underwriter active in these states should be as aware about wildfire as they are for the western states. The necessary analytics are available, and underwriters not using property-level wildfire risk models are either over-pricing the risk or neglecting the risk unnecessarily. For now, though, our thoughts are with the crews on the lines fighting the fires and the residents fleeing the flames – it is not the holiday weekend they were looking for. Let the rain come down.